Less is more, as seen in these beautifully minimalist structures designed by a group of architecture students at Ball State University. With the Form 1+ 3D printer, the designers created a series of joints, which were efficient both in function and form. The design challenge: to create systems whose final form would be larger than build volume of their tool, the Form 1+ 3D printer. It was in part inspired by Hyperform by Skyler Tibbits, a feat which created the world’s longest 3D printed chain on the Form 1+. “Rather than creating large robotics to fabricate large-scale objects, we will focus on designing a compact system with the ability to aggregate into larger, more robust forms,” says Andrew John Wit, who designed and taught this class. With the Form 1+, the designers could quickly design, print and test effective parts on the fly. “This is especially helpful for our work in robotics, where all end effectors have to be custom fabricated. 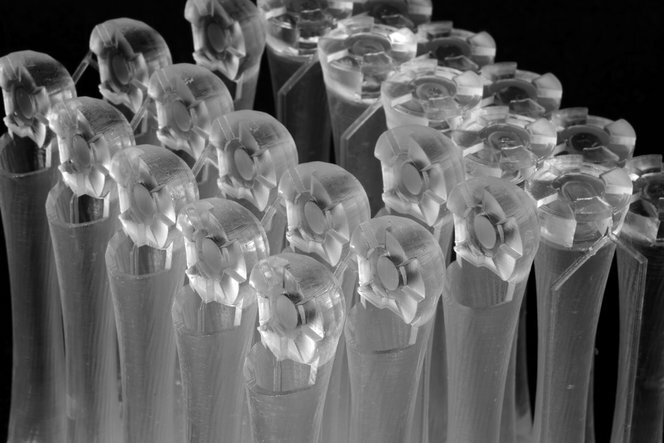 And with the new 200 micron resolution, we could print them extremely quickly,” says Andrew. This group designed volumetric “jacks” with embedded magnets, which could be built into complex structural systems many times the print size. A system of high precision magnetic joints allows the user to reconfigure and grow the system in many ways. Talk about efficiency. The group integrated PreForm print structures as part of their design to create a telescoping and locking action after printing.